Last weekend we went to the Seattle aquarium with Trina’s uncle Paul, cousin Gina and her two little girls Marlo and Annika. Although the day started off as another gloomy summer day in Seattle, by the time we packed the Saturn full with seven people and a stroller and headed down 15th Ave NW toward the waterfront, the sun was peaking out and the rain gear wasn’t needed. The aquarium was busy, but not as crowded as we have seen on other days (i.e. Fathers Day last year). With four adults and three kids four years old and under, the adults felt outnumbered. Annika LOVES fish and was clearly excited to be at the aquarium and moved quickly between exhibits. The combination of her excitement and curiosity, speed, and ability to disappear behind a set of adult knees made it hard to keep track of her. She was having tons of fun. Molly enjoyed it as well, except when there were divers cleaning the tank. The divers in their SCUBA gear scare her. I was expecting nightmares that night. After visiting the aquarium we let the girls play outside in the sun on the pier. The girls jumped, climbed, and ran all around. 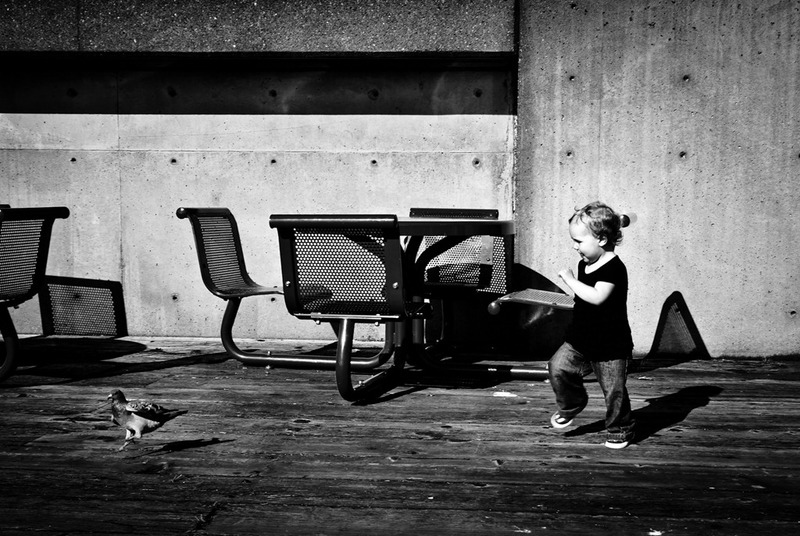 Molly found a pigeon and chased it around the sets of tables and chairs, giggling the whole time.